Think of cabinet hardware as a tool to help you define your kitchen's theme and personal taste. The hardware you ultimately choose for your kitchen is just as essential to the design as the cabinets, furniture, appliances and decor. 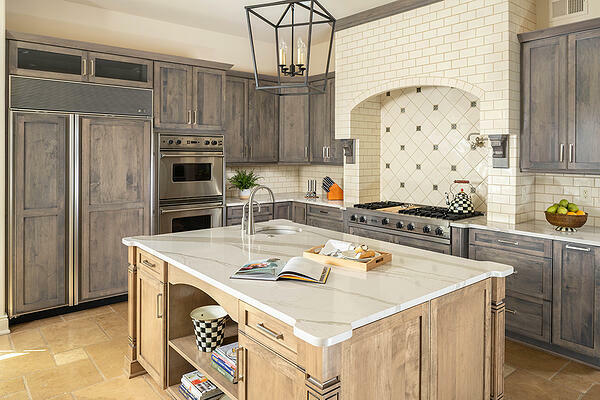 However, it's more of a finishing-touch element, making it one of the easier and already narrowed-down decisions to make during your kitchen remodel. Perhaps you aren't quite ready for a full-on remodel, but you're looking for an easy and affordable freshen-up for your kitchen. Updating your cabinet hardware is a great place to start, and a simple option for DIYers to easily execute on their own. 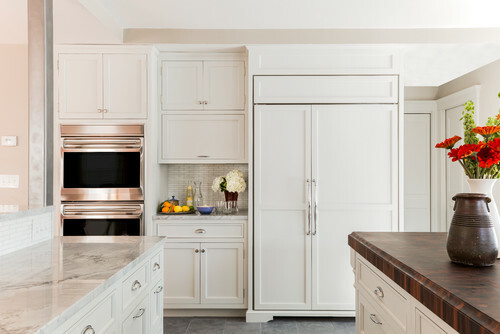 Either way, if your partial to silver-toned metals, this article will provide all of the information you need to find the ideal knobs, pulls, and/or handles for your kitchen cabinets. Although predominantly found in contemporary kitchen spaces, chrome, nickel and stainless steel cabinet hardware all have a fabulously neutral silver tone. Their colors include whites, silvers, and an array of grayscale hues, depending on your chosen finish and whatever way the light catches it. The biggest challenge when trying to select between these three materials is that they appear almost identical depending again on lighting and surface finish. Understanding the differences between chrome, nickel, and stainless steel can help you select the best type(s) to fit your needs. Chrome cabinet hardware has a metal core plated with thin chromium veneer. Standard chrome has a polished surface that shines like a mirror and reflects light. Satin or brushed chrome has a more matte surface. Chromium plating doesn’t rust, but can appear dull when damaged. The metal core can rust if it loses plating from accidental damage or natural wear. Polished surfaces like chrome are difficult to clean because they easily reveal fingerprints and scratches. Depending on the quality of the hardware, and how you care for it, the chromium plating can peel or flake. If a kitchen is in a sunny area and has too many windows, glare can become an issue. Where does chrome look best? Some designers would probably just rule out chrome and advise that it just isn’t in style right now. We would call that hasty. The fact that chrome isn’t considered “trendy” at the moment, doesn’t mean it can’t be stylish—and let’s face it, our trends are cyclical, and it will likely come back around in style. At any rate, chrome’s current lack of popularity actually makes it perfect for those who are going for a unique look. Our vote would be to use chrome in modern, contemporary, and transitional kitchen designs. It looks best against a lighter background like white or light gray or greige cabinets. Nickel cabinet hardware also has a metal core plated with thin nickel veneer. Although nickel hardware can have a high polish or satin finish, it can also have a darker weathered or antique appearance. There are a lot of options when it comes to nickel finishes, they vary in tone and can sometimes be on the warmer side of silver. Nickel resists corrosion and wear, but can dull and tarnish over time. It is often lacquered to help slow the process. Nickel has a couple drawbacks, similar to chrome. Again, lower-quality or poorly cared-for nickel hardware may have the issue of peeling or flaking. A good practice for nickel (and chrome for that matter) would be to wipe the hardware down, because oils and greases can accelerate that process. Where does nickel look best? Nickel held the reigns of the hardware kingdom for years, but in recent years brass, black, and other finishes moved in to create a power-struggle. But, the nice thing about nickel is the variety of finishes from which you can choose. 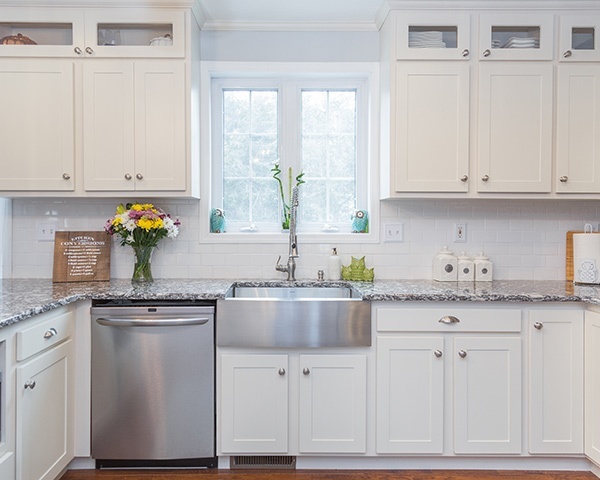 Nickel will work for just about any kitchen style and cabinet color. But, of the 3 silver-toned hardware materials we’re covering here, this one is going to be the best bet for traditional and farmhouse kitchens. True stainless steel hardware is typically made from a metal alloy that doesn’t have plating. Its composition does contain chromium and/or nickel to make it durable. Quality stainless steel hardware is corrosion-, tarnish-, and scratch-resistant. Stainless steel comes with the fewest warnings. Without any plating or veneer, you don’t have to worry about the outer layer wearing off. You could really consider this a maintenance-free hardware option. You will still want to be mindful of the potentiality for fingerprints and glare, though not nearly as much as with chrome. Where does stainless steel look best? Many would associate stainless steel hardware with contemporary kitchens, as the iconic bar-pull handle is typically made from this material. 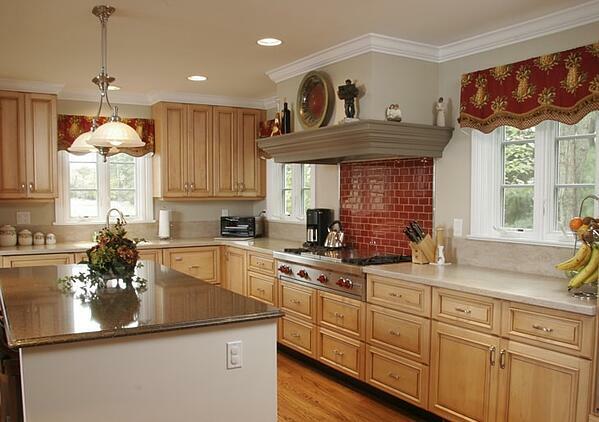 But, below we see stainless steel hardware in a lovely traditional-leaning transitional kitchen. Stainless steel is just incredibly versatile in terms of kitchen style. However, you may not find as many finish options as with its closest counterpart, nickel. This is the hardware to choose when your priority is durability. If you still feel like you just can't choose, think about mixing and matching. 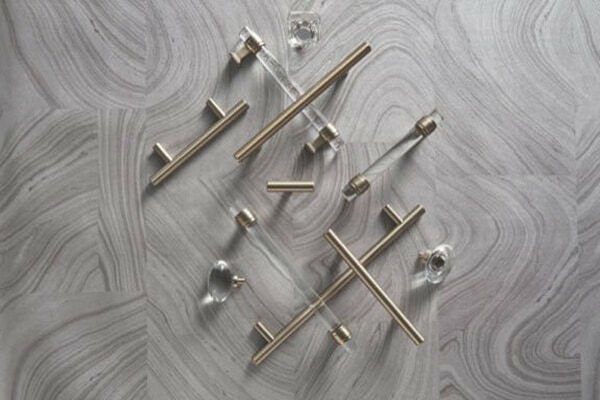 As long as the hardware styles match your tastes and kitchen theme, you don’t need to use only one type of material. For example, you can use weathered nickel on an antique-style standalone pantry, while using satin chrome, or a mix of polished and satin chrome, on the rest of your cabinetry. “Amerock’s products are designed to mix and match across collections,” says Michelle Zeller, CMO of Amerock® Hardware. “This allows homeowners to create a style that's uniquely their own — for example Amerock’s Bar Pulls and Glacio Knobs fit together seamlessly."